Dugout canoes were one of the earliest forms of canoes. These simple watercraft, which were used throughout the Americas, West Africa, the Caribbean and other parts of the world, consisted of large felled trees that were hollowed out through repeated burning and scraping. The advent of iron tools simplified and sped the hollowing process and helped create dugouts that were watertight and stable enough to support dozens of people. These primitive canoes are still used today in various parts of the world, and the simple yet effective design is now being used to craft one-of-a-kind luxury baths. Few materials can equal the organic feel, natural beauty and unique patterns found in wood. Timber Neutral has found a way to transform solid wood into two-person bathtubs. 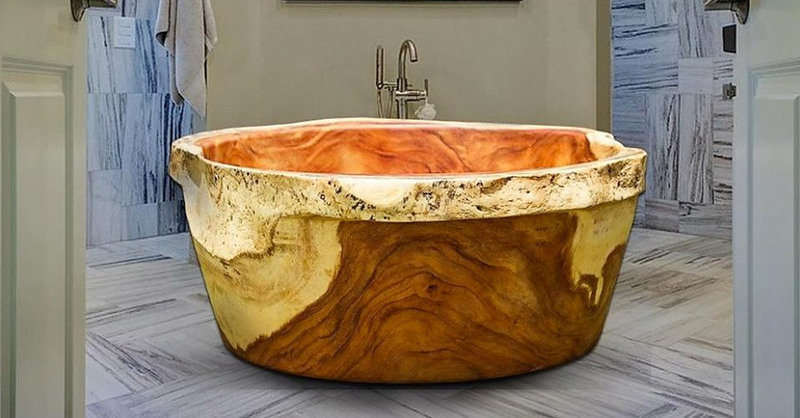 Each tub is crafted from a solid 6,600-pound block of wood. Every step of the harvest process is designed to be sustainable from the time the massive trees are harvested from Columbian forest and a team of horses pulls the tree from the forest until the trees are replanted. Only a limited number of tubs will be made from trees that are less than 75 years old, or about the age of a mature oak or beech. Once a tree has been harvested, the company replants an endangered species. The goal for Timber Neutral is to replace not necessarily the fast-growing common trees that were cut but also to ensure continued sustainability by planting dozens of endangered trees. Once the harvested trees arrive at the workshop, skilled architects and designers create a pattern based on the structure of the wood. Every one of the 2,000 species of trees used commercially has unique aesthetic properties, and the wood’s contours and characteristics are capitalized on as it is carved and polished to perfection. Once the bath is finished, it is allowed to dry, a process that takes about three years. During this time, the wood ages, hardens and cures, eliminating the need for epoxy or glue. The finished bath is then christened with a name that honors its origins and its personality. These limited-edition tubs are only available through AmelieandMax.com. Jacaranda, Inc., follows similar principles of sustainability when creating its luxury wood veneers. As the demand for wood soars, Jacaranda, Inc., is actively supporting efforts to protect the environment by developing methods to reduce waste and lower our impact on the environment while maximizing yields. Our patented natural wood veneer process boosts the yield of every log by about 300 percent. We carefully select individual trees from old growth forests to make room for younger, more robust trees, resulting in healthier trees overall. Plantation-grown trees can be altered to simulate exotic species, increasing the population of endangered species in their native lands. We also financially contribute to organizations that work to protect the environment. Our architects and designers are constantly seeking new ways to bring the natural strength and beauty of wood to you while creating a healthier world around us. Contact us to learn more about the variety of rare and exotic wood veneers we offer.